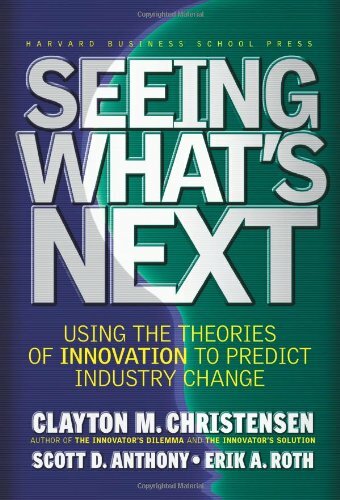 “Seeing What’s Next – Using the Theories of Innovation to Predict Industry Change”, by Clayton M. Christensen, Scott D. Anthony and Erik A. Roth. Copyright 2004 Harvard Business School Publishing Corporation. 312 pages. Clayton M. Christensen’s first book, The Innovator’s Dilemma, was a work of impressive insight and originality. His second, The Innovator’s Solution, was somewhat less insightful but added a necessary extension to the fi rst by telling readers how they might begin to extricate themselves from the dilemma of industry disruption caused by an upstart innovation. The current book is a dense, harder to read compilation of the first two books, with added theoretical insights. Christensen and co-authors Scott D. Anthony and Erik A. Roth tell readers how to use theories of innovation to predict change. It is important to account for a theory‘s exceptions and anomalies, but when a solid theory is developed, practitioners can put it to good use. Disruptive innovations: These innovations change the value proposition. Initially, disruptive innovations under-perform mainstream products but offer some advantages of cost and ease of use. They cause fundamental changes in the marketplace. The customers for sustaining innovations are an industry’s mainstream buyers. Typically these customers are not interested in disruptive innovations. This is because, like their established traditional suppliers, they are part of a value network that prizes performance as measured by pre-defi ned metrics. The customers for disruptive innovations are usually at the low end of the market, or may not yet be in the market at all. It is common for established companies to improve their products to the point that the products offer better performance than the market really needs – and cost more than the market would prefer to pay. Disruptive innovators offer products that are technically basic, but that function well enough to satisfy customers at the low end of the market. They often succeed because those people are tired of paying for more technology than they need. Alternatively, disruptive innovators offer a better-than-nothing proposition to people who are not currently in the market at all. Although disruptive innovations begin their sales attack at the low end of the market, they quickly move up the market chain. Consider telecommunications, for example. Alexander Graham Bell began with a rudimentary device that allowed people to talk to each other over short distances. Technologically, the fi rst telephone was not an advance over the telegraph. The telegraph, after all, allowed communication over long distances. It is no wonder that Western Union declined to purchase the Bell patents, even for as relatively small a sum as the $100,000 the inventor wanted. But although Bell’s phone was not as powerful as a telegraph, it did enable people to talk to their neighbors without having to walk to a telegraph station to have the exchange. It was better than nonconsumption. Moreover, Bell steadily improved the technology and the telephone network, and within a short time, his AT&T eclipsed Western Union as the telecommunications leader. Resources are the assets that a company commands. Processes are its way of working. Values are the criteria it uses to make decisions. Collectively, resources, processes and values determine how a company evaluates and responds to an opportunity. One of the disruptive innovator’s most powerful competitive advantages is that it does not make sense for established fi rms to compete in the market that the disruptive innovator has targeted. Because the disruptive technology is usually less powerful, less sophisticated or less functional than existing technologies, the established firm’s customers generally are not interested in it. Moreover, the disruptive technologies usually earn lower profit margins in the marketplace. So, an established company looking at a disruptive opportunity is looking at something its customers do not want and that is less profi table than its alternative investment opportunities. It is not irrational for established fi rms to ignore disruptive opportunities. On the contrary – the decision not to compete in disruptive technology is often a sound business decision. It only looks disastrously wrong in retrospect. Customers do not really purchase products. They really hire performance – the ability to accomplish jobs. The most successful companies make it possible for customers to accomplish their jobs more economically or conveniently. Market segmentation can be misleading, because market segmentation rarely looks at how customers actually use a product. Companies that segment markets according to demographics or product preferences miss the point. Companies can develop breakthrough innovations if they pay close attention to the jobs people are trying to do and fi nd ways to make it easier, cheaper or less unpleasant to do those jobs. What are our customers trying to do? Is our current technology too much for the job? Too little? Is there a large group of nonconsumers who might be interested in a new offering? Do fringe markets present opportunities for growth? What innovations have customers been willing to pay a premium for in the past? What business models are our current competitors using? Does the innovation fi t naturally into our target market? Is an important competitor signaling that it intends to abandon the low end and move up market? If so, can it? Does the situation favor an attacker or an established fi rm? In cases of sustaining innovation, the established fi rm has an advantage. In cases of disruptive innovation, the attacker has an advantage. Is the company giving enough leeway to managers to allow them to discover the right strategy by trial and error, or is it attempting to impose a strategy from above? Do investor expectations match the needs and the reality of the company? Is it advisable to spin out a disruptive unit to free it from the constraints of the corporation’s value network? IBM took this approach with the personal computer, Hewlett-Packard with the ink-jet printer and Intel with its Celeron chip. Nonmarket forces can have a major impact on innovation. Government regulation or policy can push an industry toward or away from innovation. The 1996 Telecommunications Reform Act in the United States was intended to encourage competition through deregulation. But regulators don’t always get what they want, or in the form they want it. Market uncertainties, technical challenges and the popping of the technology bubbleled to chaos in the telecommunications market and left policy makers perplexed and frustrated. Making innovation legal does not make it happen. The education industry may be ripe for disruption. Distance learning institutions such as the University of Phoenix have harnessed technology and reached out to underserved customers with simple, inexpensive, convenient educational products. They will continue to improve their offerings. Community colleges are active at the low end of the market, providing good-enough courses to students for whom other alternatives are inconvenient or too expensive. They are also improving their educational offerings. The airline industry also faces serious disruption. While Boeing and Airbus fi ght for the market’s high end, manufacturers of smaller jets that fly regional routes are doing well. Meanwhile, established commercial airlines continue to feel competitive pressure as discount airlines move up the market from their foothold at the bottom. Although disruption is occurring industry-wide, it is unlikely to reshape the industry fundamentally. Look for incumbents to create spinouts, and for discounters and independents to attempt to create new value networks. The health care industry is a classic disruptive opportunity. Patients have to pay for more technology than they actually need. In some circumstances, those who are ill certainly do need the best experts, high tech tests and specialists – but not in all cases. Today’s system offers patients one-size-fi ts-all health care. Disruptive innovations would allow low-cost, low-margin and less technically sophisticated care to be provided at the low end of the market, or to be offered to current nonconsumers of health care. Successful disruptors will push health care from treatment to prevention. Good management theory is grounded in real circumstances and explains why things happen. The theory of disruptive innovation explains that companies fail because they do the right things – things that are correct in the context of their value networks. A company whose capabilities equip it perfectly for one value network may be utterly incapable of operating in another value network. Therefore, a company’s resources, processes and values are sources of both potential strengths and potential handicaps. Established incumbents – those that do a better job of serving the existing needs of mainstream customers – usually have an advantage with sustaining innovations. Disruptive innovators have an advantage in areas of the market that the incumbents often prefer to ignore – the low-end business and the nonconsumers who are not presently in the market at all. Distinguishing between sustaining innovations and disruptive innovations can be diffi cult, but doing so is essential for strategic success. Note also that nonmarket factors, such as government regulation, can have an important (though not always decisive) infl uence on the direction an innovation takes within a market. Clayton M. Christensen is the Robert and Jane Cizik Professor of Business Administration at Harvard Business School. Scott D. Anthony is a partner at Innosight LLC. Erik A. Roth is a consultant in McKinsey & Company’s Boston office.